Christmas is just days away. And soon, 2015 will be over. We're keeping it festive at Tone on Tone! 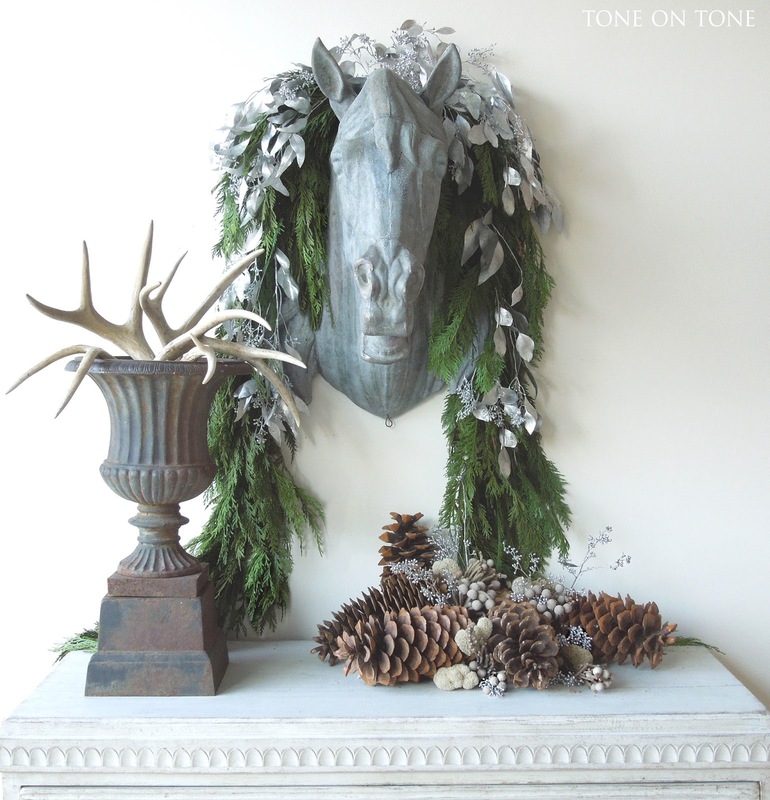 Enjoy this holiday vignette with gatherings from nature. 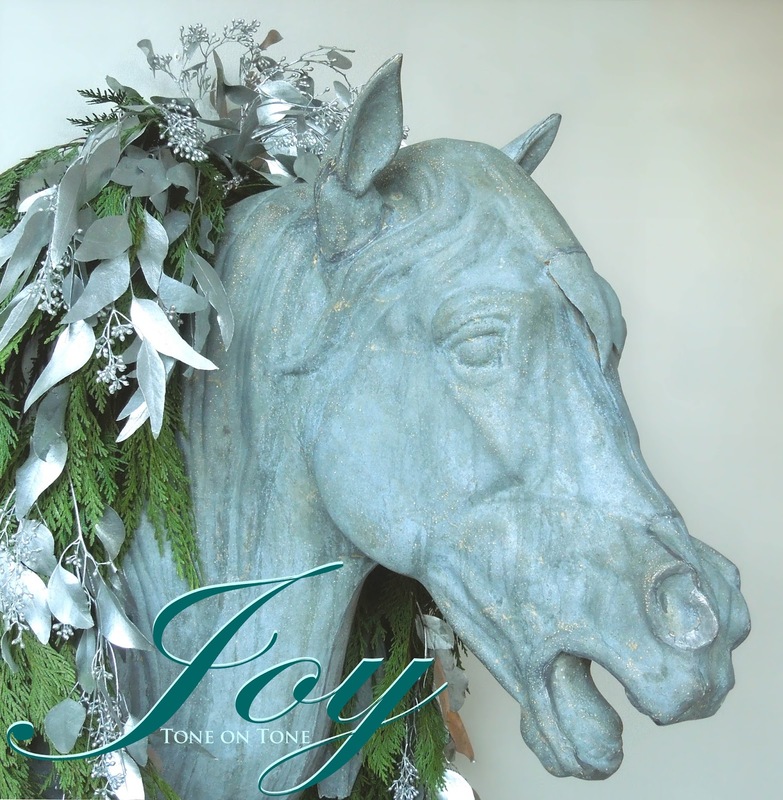 Wishing you much joy now, and in the year to come. 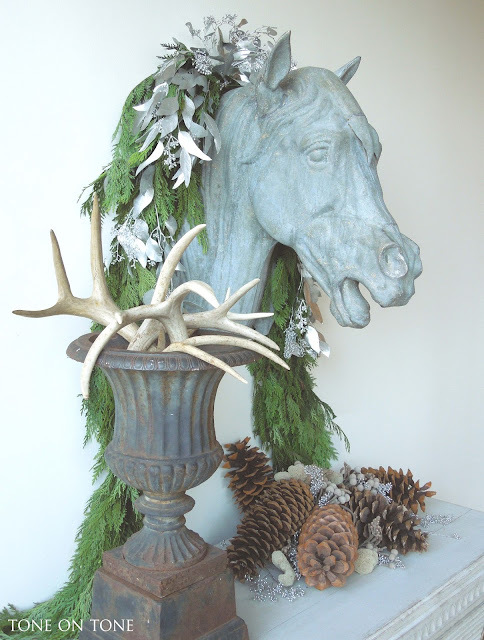 Teaming up with Ellen Seagraves, my dear friend and longtime florist, we draped a fresh cedar garland accented with silver-painted eucalyptus sprigs around a zinc horse head suspended over a Swedish chest. 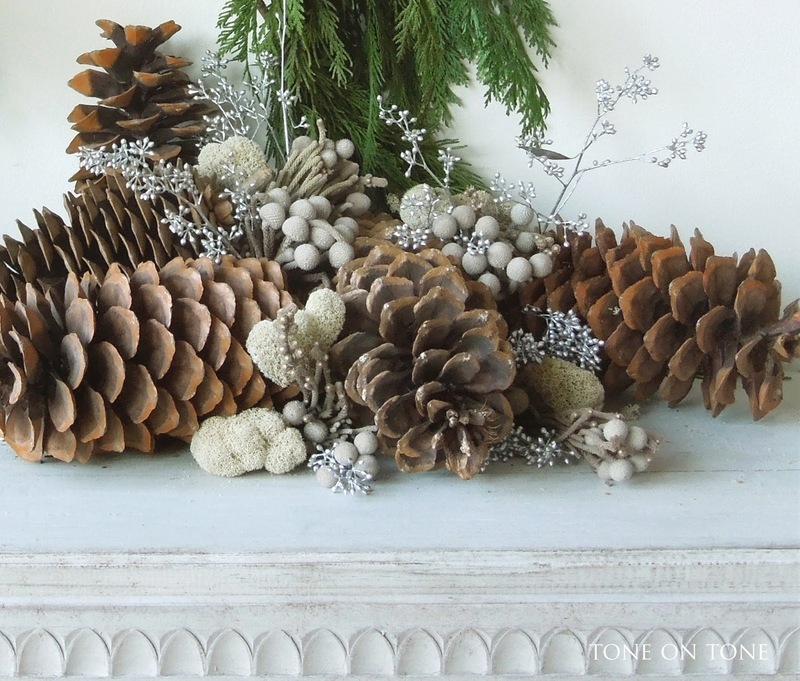 A few more sprigs of eucalyptus add just the right amount of sparkle to a cluster of giant sugar pinecones tucked with brunia berries and moss. 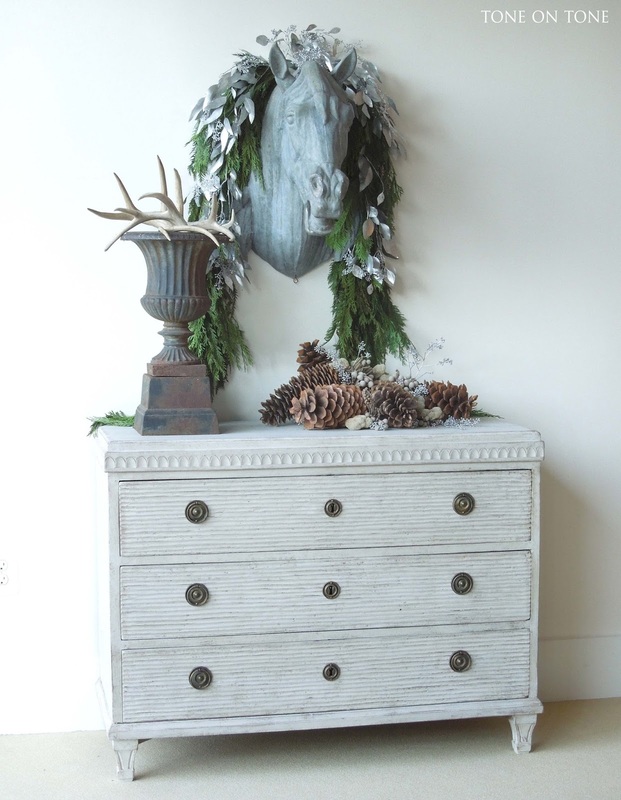 Continuing the woodland theme, shed antlers fill an iron urn with rustic flair. A very warm thank you to the hugely talented Ellen. Have you decorated for the holidays? 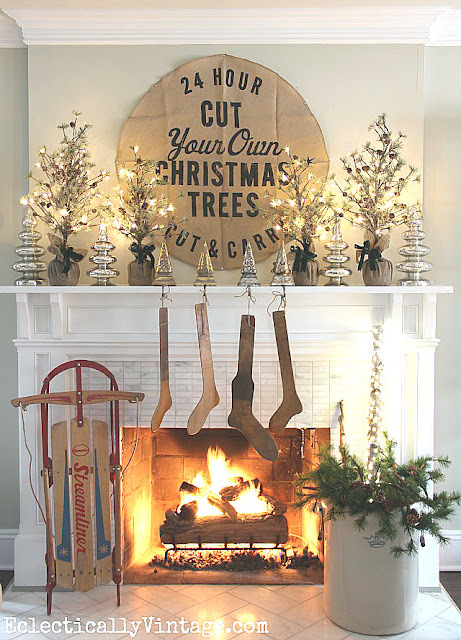 Tom and I are busy wrapping up a few projects before joining in the season's festivities. 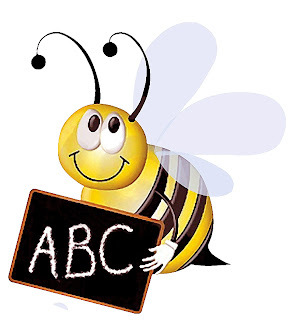 Speaking of busy, I haven't had a lot of blog time lately - apologies! There are half a dozen posts that I started which still require photographing, more tweaking, etc. Hope to share them soon. 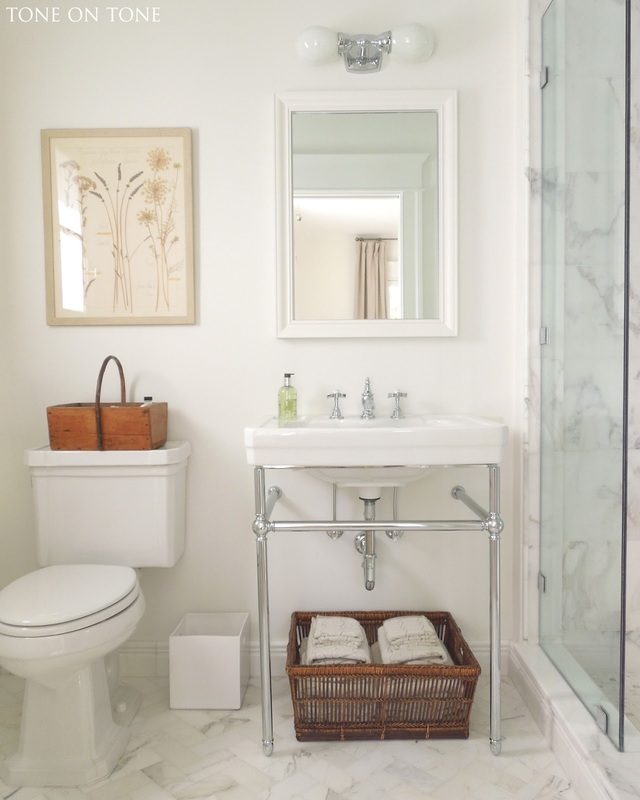 Here is a recently completed post on a small bathroom located in an upstairs guestroom. Our soon-to-be 100-year-old home has a total of three full baths plus a powder room. All of those were gutted during a major house renovation. 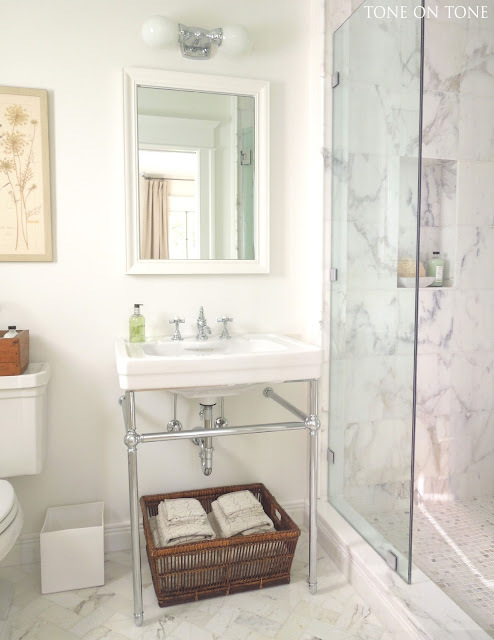 While old houses captivate me, I'm not terribly excited about their vintage baths - usually with rusty pipes, dated fixtures, and cracked tiles. At approximately 5' x 6' this bathroom is compact but not tiny (compared to others in homes from the same period). Because it's for the occasional guest (we have a private, more spacious guest suite downstairs), I renovated it sensibly yet beautifully. Storage is not an issue, by the way. So sticking with the existing footprint not only made sense, but also kept costs down and allowed splurges elsewhere. Let's take a look. 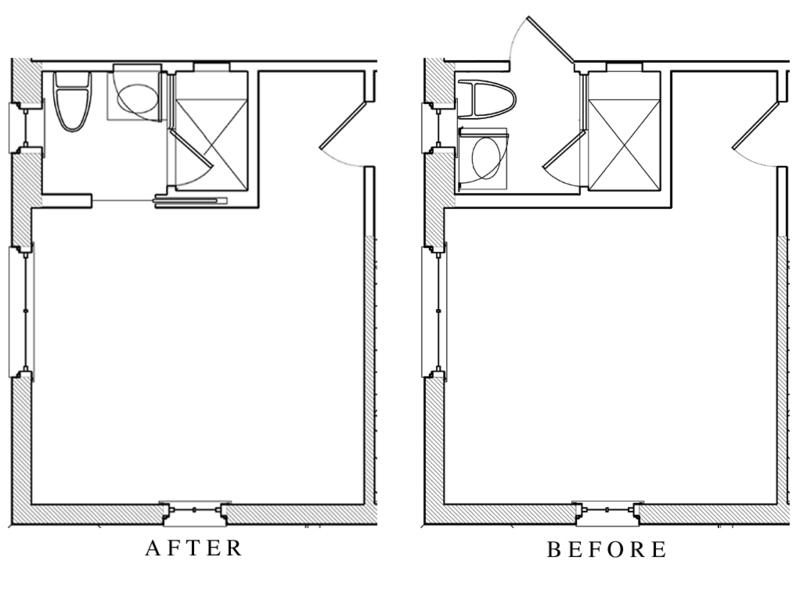 Above photo shows the bathroom after renovation, and below is before. 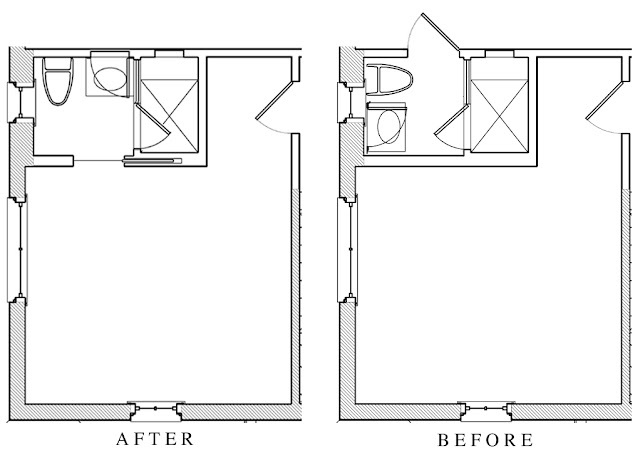 -Converted to en-suite by connecting new entry to guestroom. -Replaced swinging door with pocket door to better suit tight space. 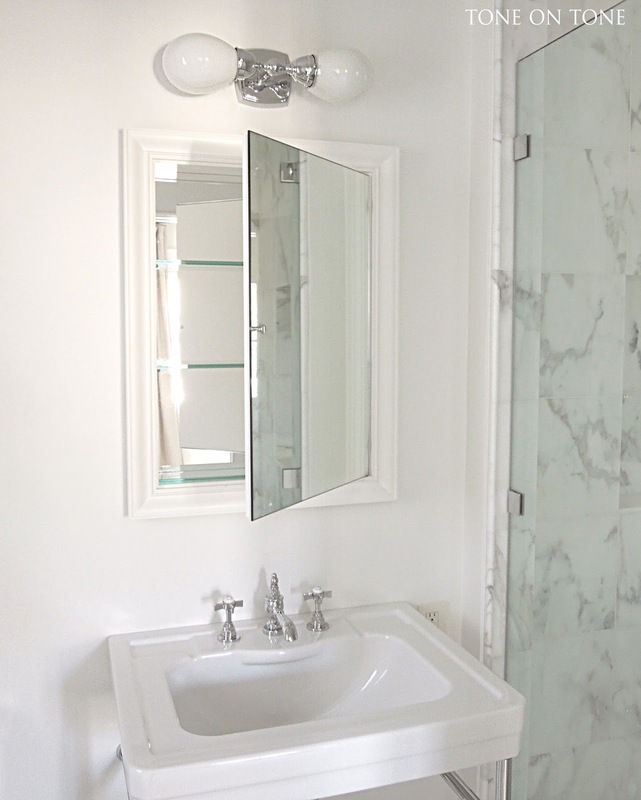 -Installed all new plumbing, fixtures, fittings, lighting, and tiles. 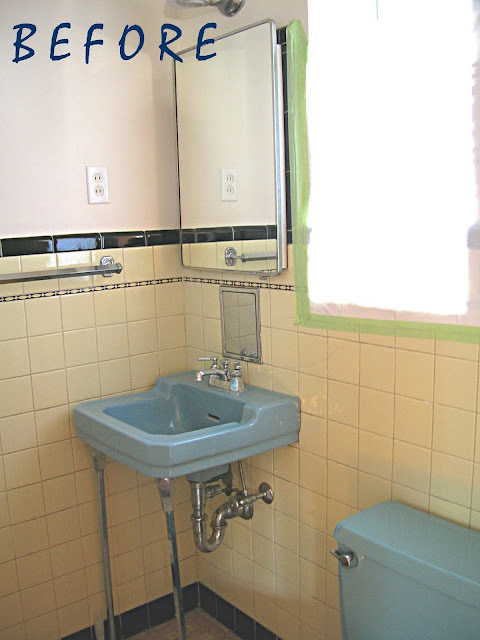 -Relocated sink and toilet to improve flow. -Replaced old drafty window with energy-efficient double-pane window. Much brighter! The window size stayed the same, so what changed? Meet my friend Calacatta! 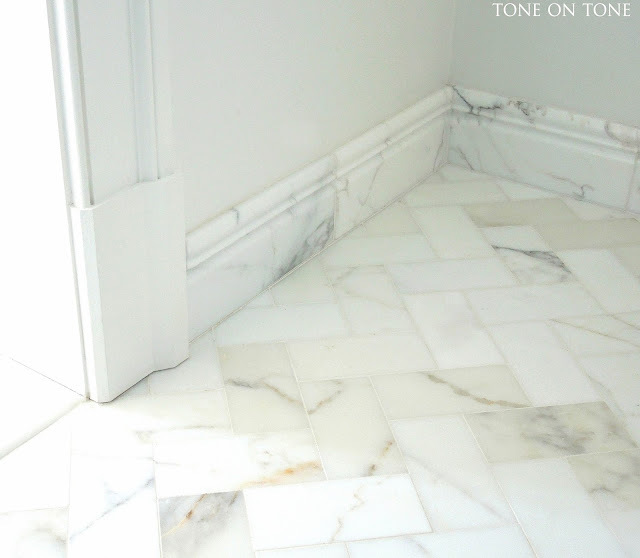 Let's chat marble. 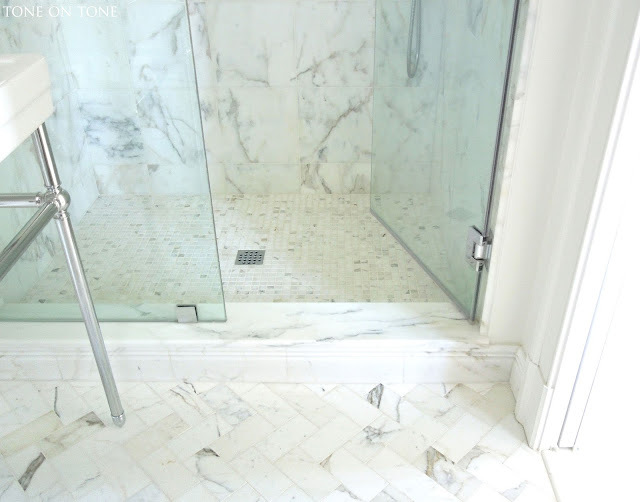 First of all, upgrading from ceramic tile to marble did raise costs but, in a room of this scale, that increase wasn't prohibitive. 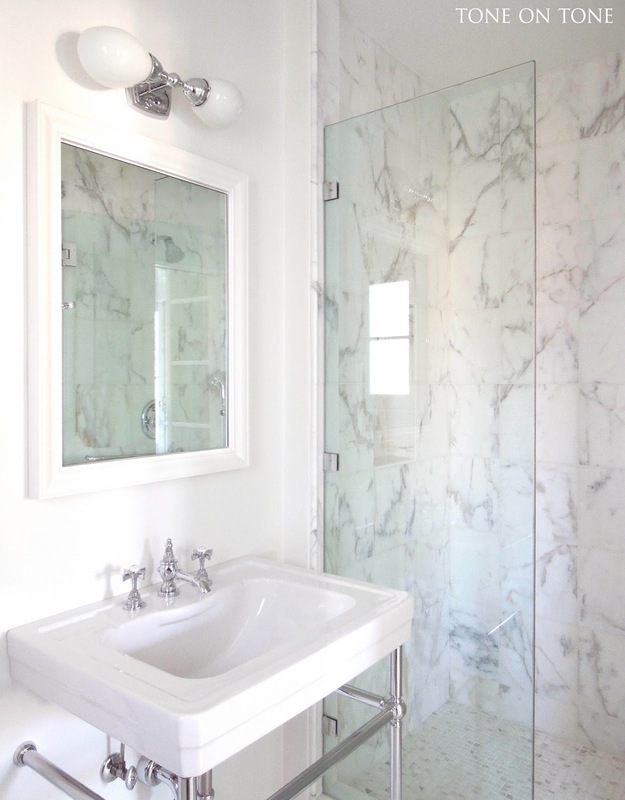 Marble is all Calacatta, which is not as gray or muddy as Carrara. 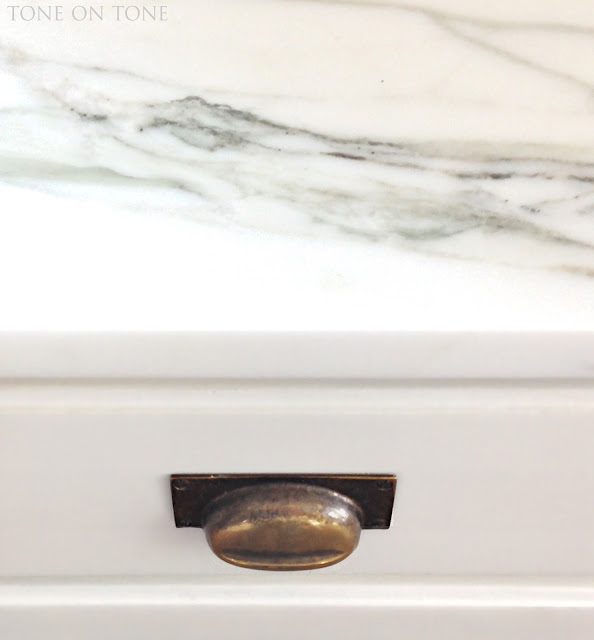 Carrara is hugely popular; I do love and use it when appropriate. But the morning light of this room wanted warmer, clearer tones. For the 40" x 54" shower stall, I originally selected three marble wall slabs. 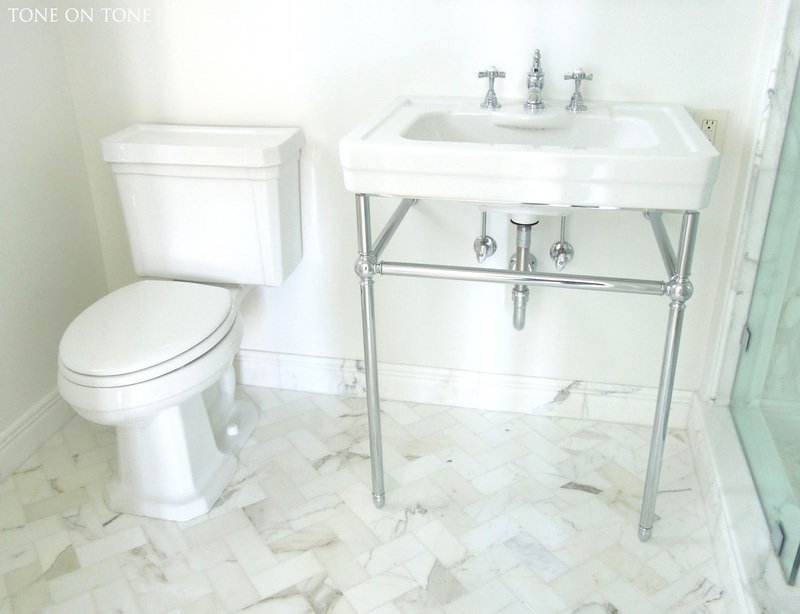 Then I opted for 12" x 12" wall tiles to make the budget friendlier, which allowed for more marble splurges: herringbone floor with 3" x 6" tiles, custom one-piece thresholds, carved baseboard tiles, and mosaic shower floor. 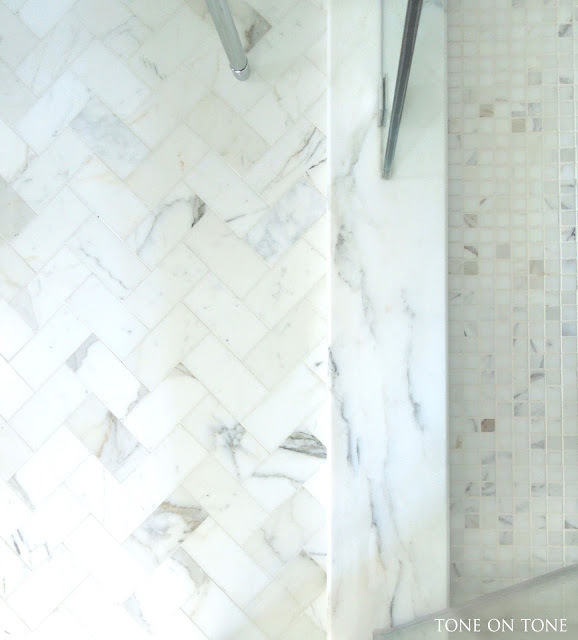 Mosaic tiles work great in shower floors. Arranged on flexible sheets, those mini pieces conform well to the pitch of a shower floor. Plus the texture helps reduce slipping. Notice the grout lines are barely visible. 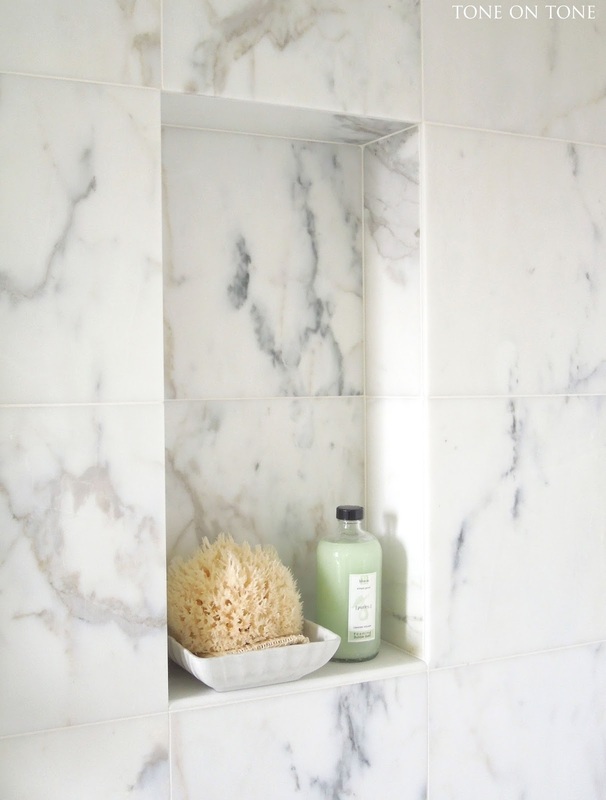 It's about the marble, not the grout. 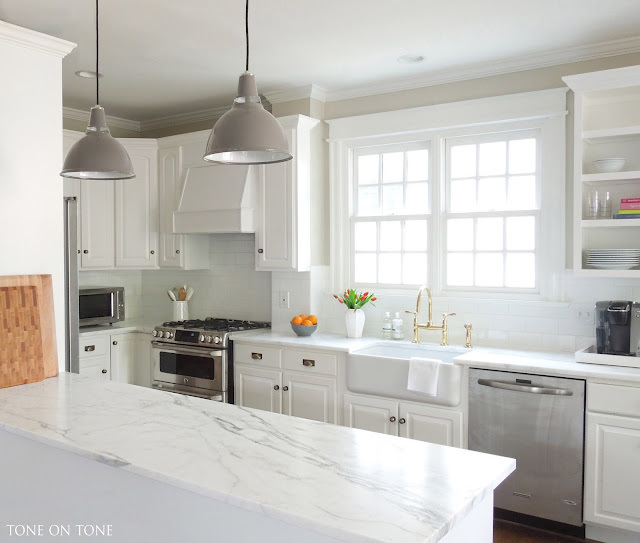 Calacatta mix. 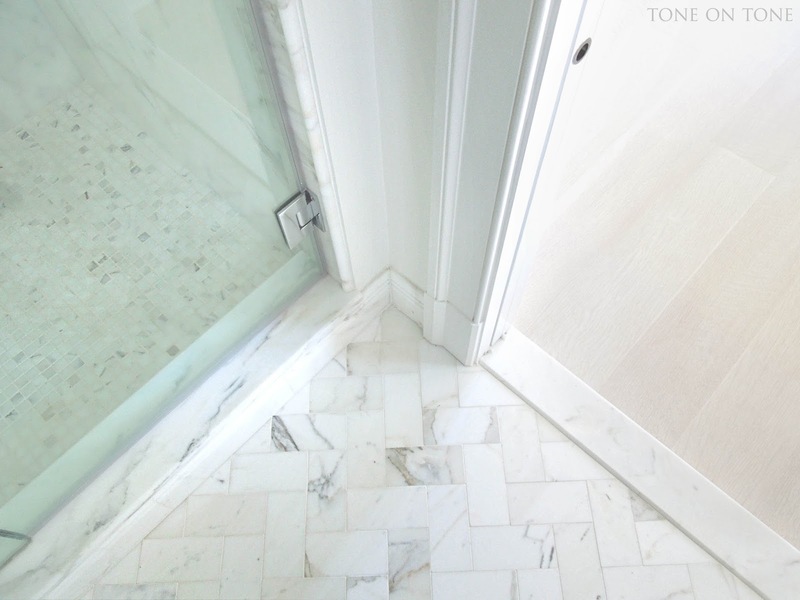 ABOVE: Floor tiles in a herringbone pattern, custom one-piece threshold, and mosaic shower floor. 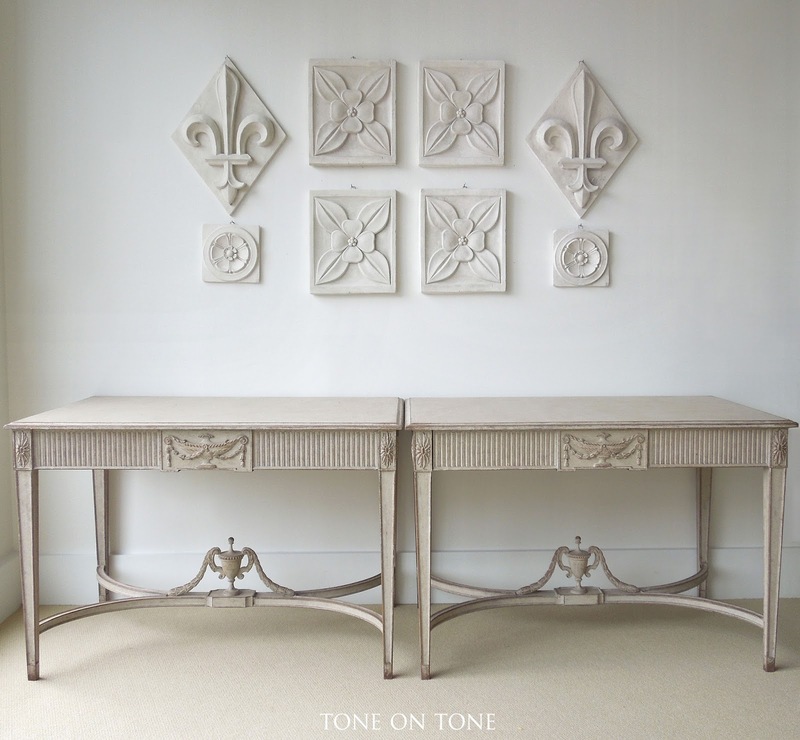 BELOW: Carved baseboard tiles. Pipes and ducts were relocated to allow room for a custom soap niche as well as a recessed medicine cabinet. 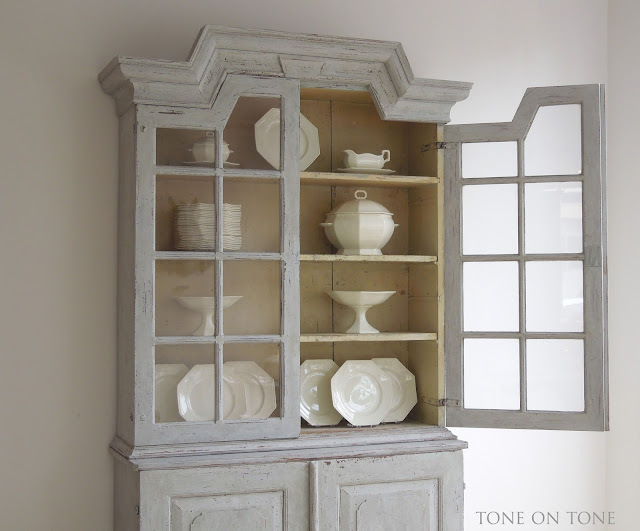 Medicine cabinet is from Waterworks. I had the wooden frame painted the same color as the trim. Note its mirrored back. Light fixture is from Pottery Barn. Both toilet and sink are from Porcher. Since there is ample storage elsewhere in the bedroom, a console sink with open base looks lovely here - simple, clean and airy. I'm thrilled with the transformation - our guests, too! Well, it's been a while! Great to be back on the blog. All good here, just lots going on. 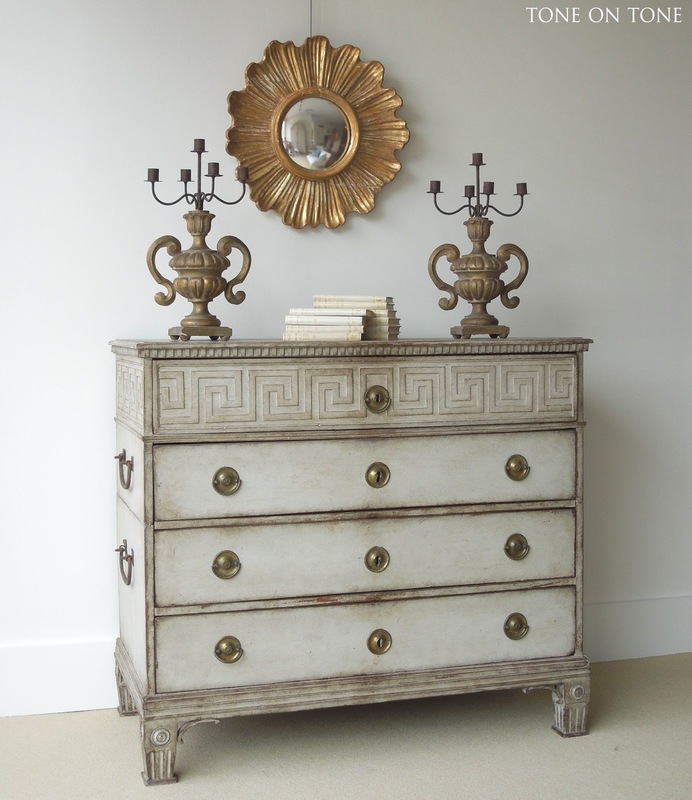 An early Scandinavian Neoclassical chest-on-chest with a graphic Greek key frieze and four wrought iron handles. This is a large piece that makes a statement, so give it a place of prominence. A pair of Italian giltwood candelabras with wrought iron arms play up those big iron handles on the chest. For more drama, I've hung an Italian sunburst mirror with an unusual form resembling a flower. 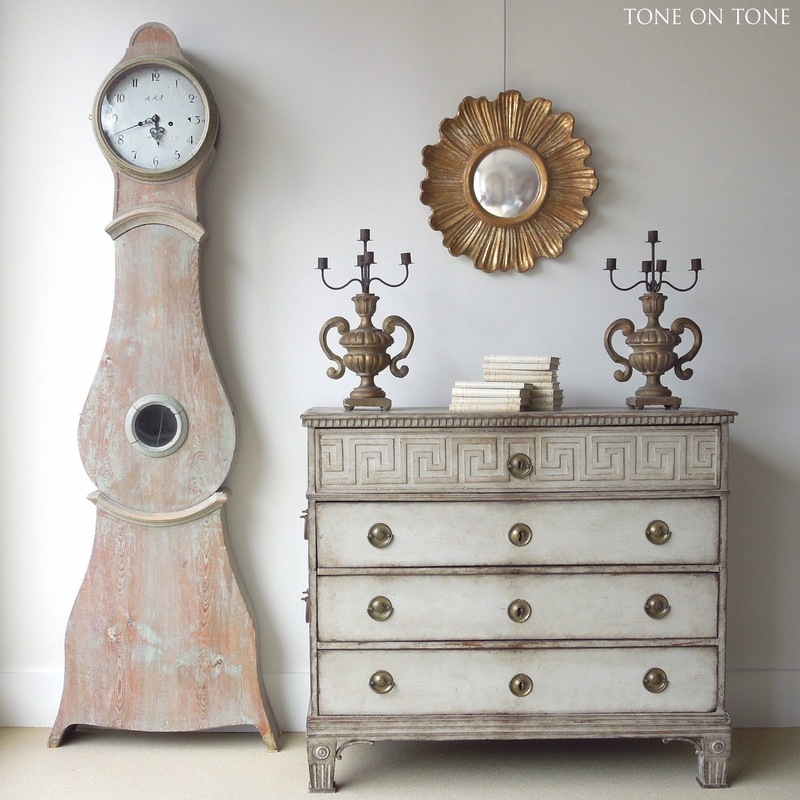 The early Mora clock next to the chest is Swedish Rococo from the 18th century. The Neoclassical bookcase is sold, so please focus on the pair of barrel back chairs. Sculptural and comfortable, the barrel back chair is a coveted Swedish chair model. These have sweeping sabre legs to boot. 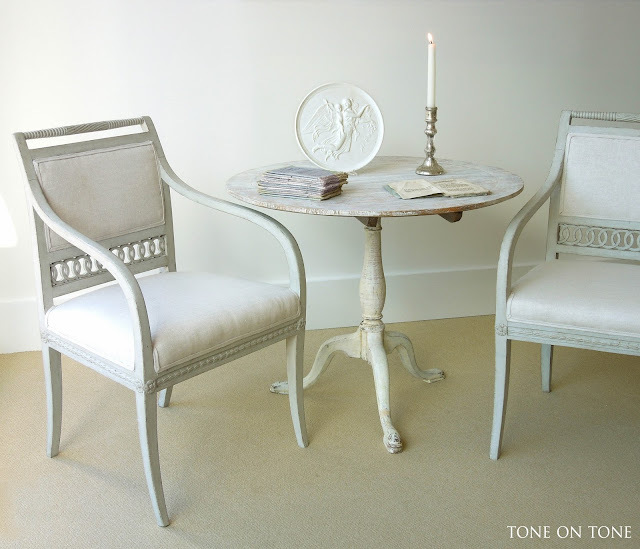 Newly upholstered in our signature greige linen, they are ready for holiday guests. 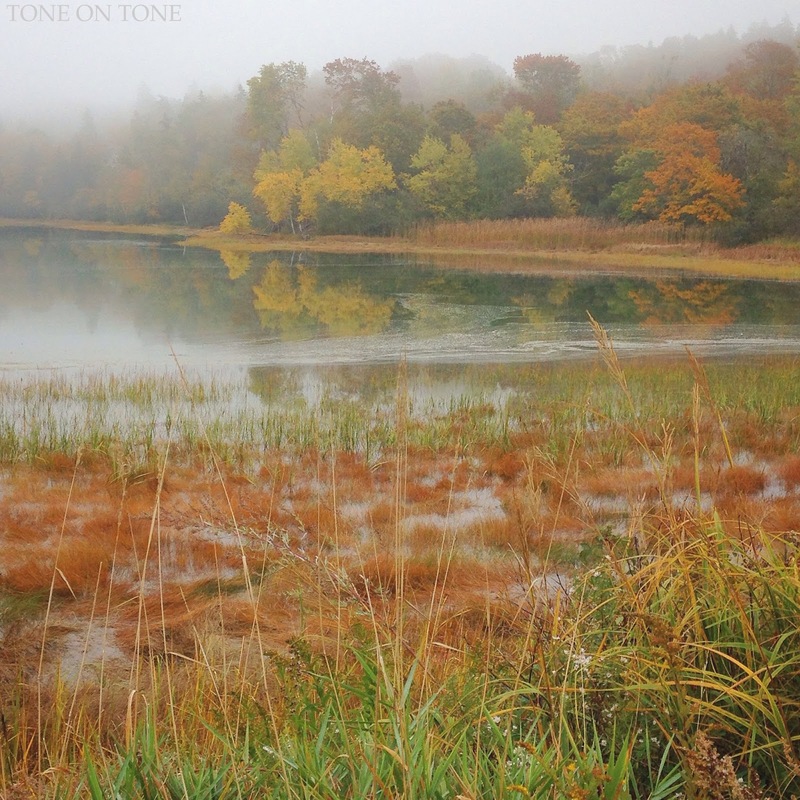 A tone-on-tone palette! 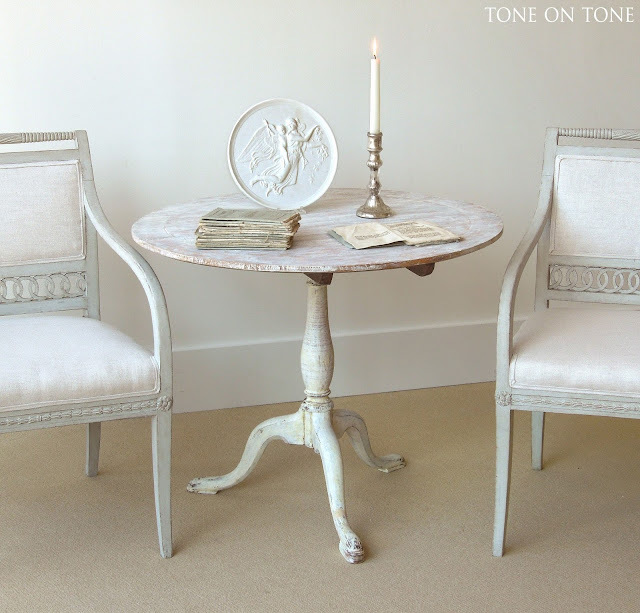 This pair of Swedish Gustavian console tables are from the last shipment, but I'm featuring them again because they fit the Neoclassical theme in this post. 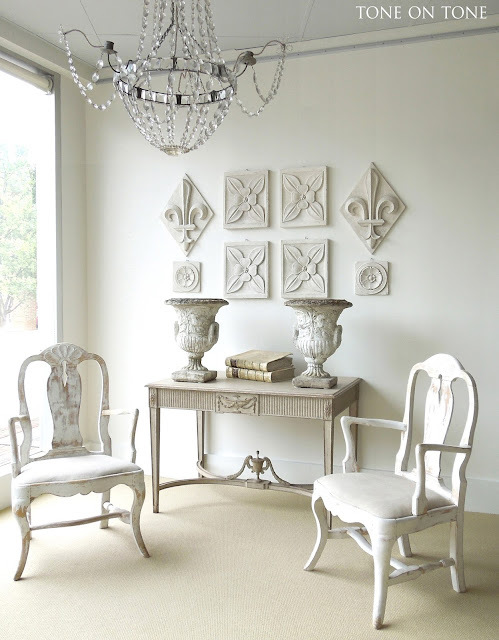 A collection of cast plaster architectural plaques from an atelier in Paris. 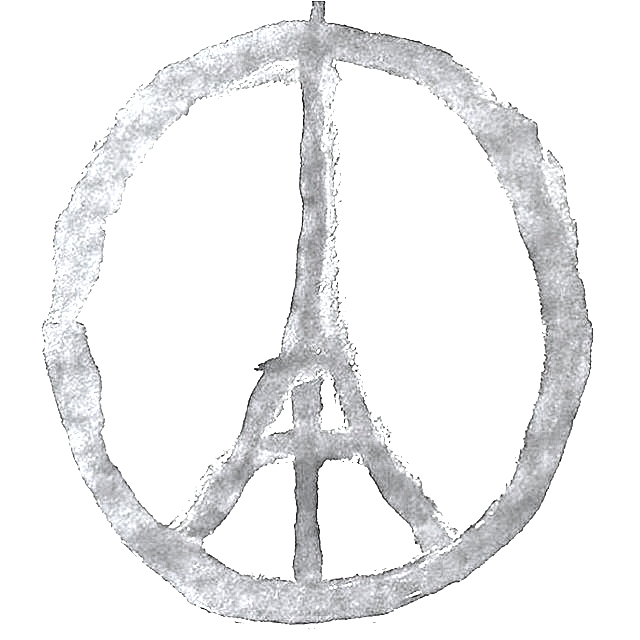 Speaking of Paris, our thoughts and prayers are with friends, colleagues and everyone there, and throughout France. L E T T H E R E B E L I G H T ! During these months when daylight is shortest, I understand why the Swedes rely on their palette of wintery whites and dove grays to brighten interiors. A pair of Swedish Gustavian chairs pulled up to a pedestal table. 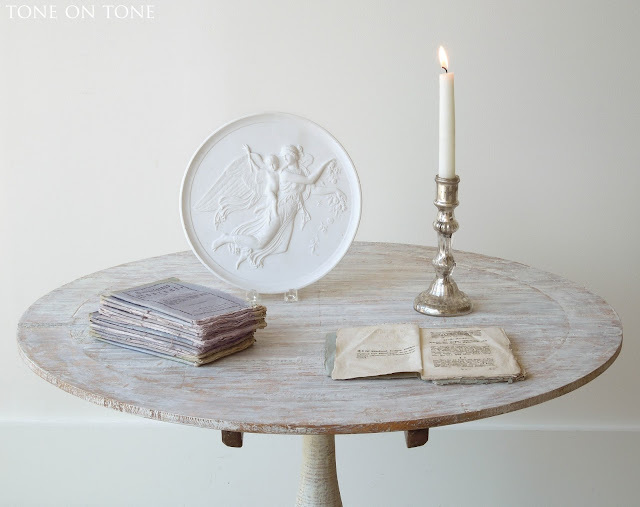 The Danish Royal Copenhagen bisqueware plaque is a copy of Day by Bertel Thorvaldsen. 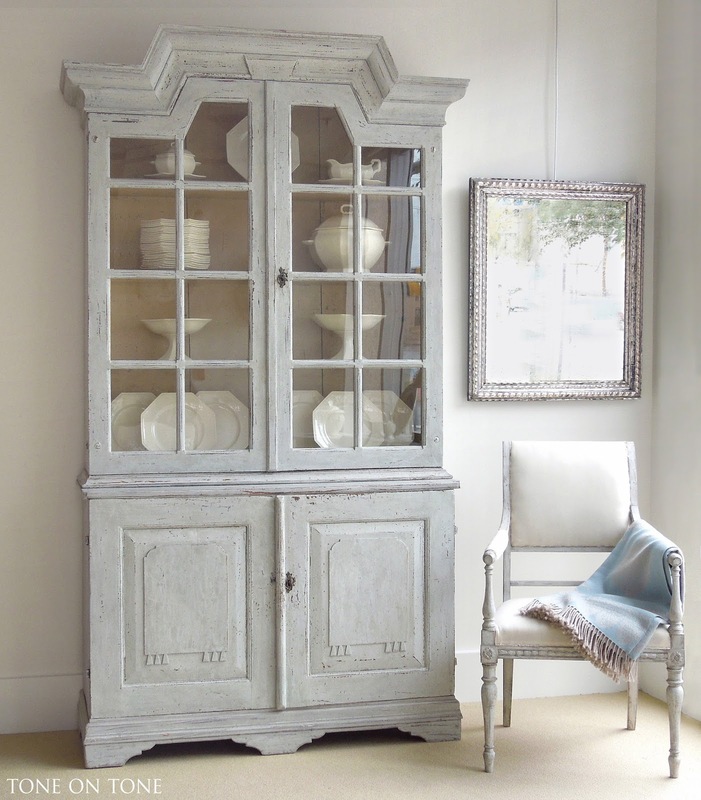 An 18th century Swedish stepback vitrine cabinet with geometric lines. Inside is a collection of antique Creil creamware from France - notice how their octagonal form echos the angles of the vitrine. Much, much more in the new shipment - please stop in to see it all. At this time of year, I normally bring out my collection of antique brown-and-white transferware. But, I'm thrilled to say the collection has found a new home. Yes, I'm paring down, becoming a minimalist. Just kidding! 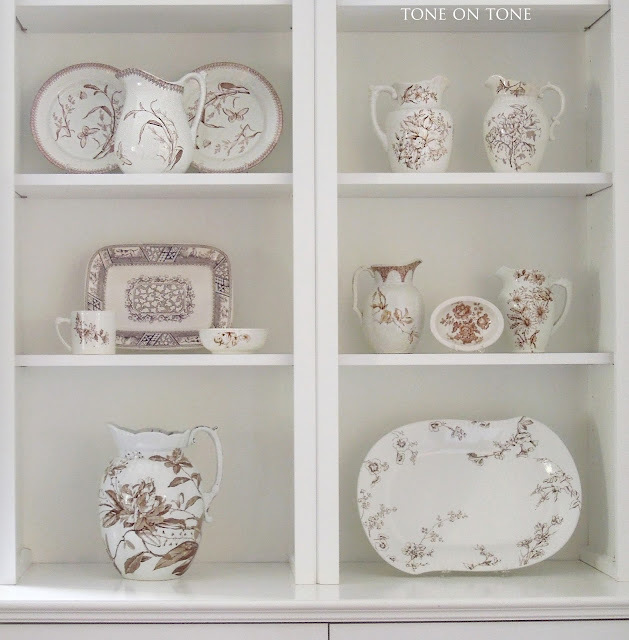 I am running out of room at home, as the other collections (creamware, ironstone, salt glaze, mercury glass, etc) have grown considerably. Just in time for Thanksgiving. Ceane and I decided the transferware should go in the built-ins of her beautiful dining room. There's still room to layer in more pieces, so it will be exciting to grow the collection. We are now working on wall art. Look for daily posts + a MAJOR announcement coming soon. Fall inside and outside our 99-year old home. I've also teamed up with three friends (Erin, Kelly, and Shannon) for a #RestyleAndRefresh Instagram challenge to showcase decor changes in our homes. 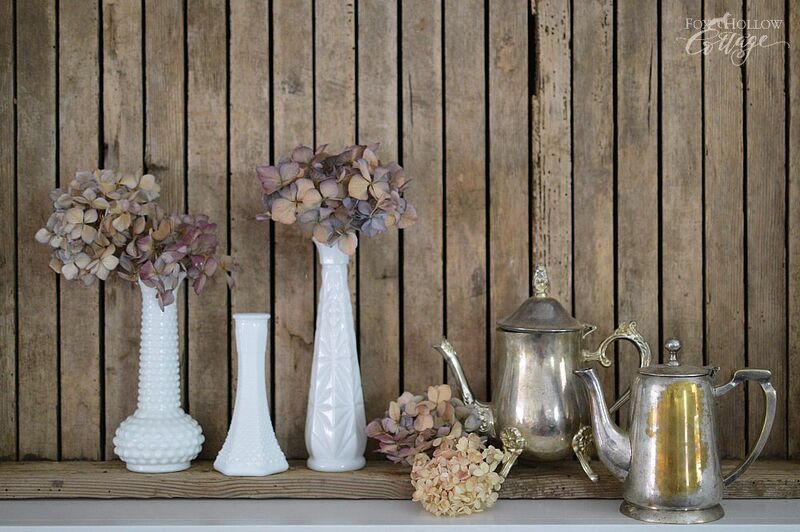 These can be new vignettes, holiday accents and / or refreshes of any kind. If you are on IG, follow the four of us and post your photos with #RestyleAndRefresh for a chance to be featured on our IG accounts and blogs. First up is Erin who recently built a gorgeous new home - lots of inspiration and ideas on her blog! Above is her stunning dream kitchen. Feel free to also share Instagram photos of updates in your kitchen, etc. Shannon fills her cottage with charm and collected pieces - she's a styling genius! Her vignettes are creative and approachable. I love Shannon's fall mantelscape with its patina and texture. 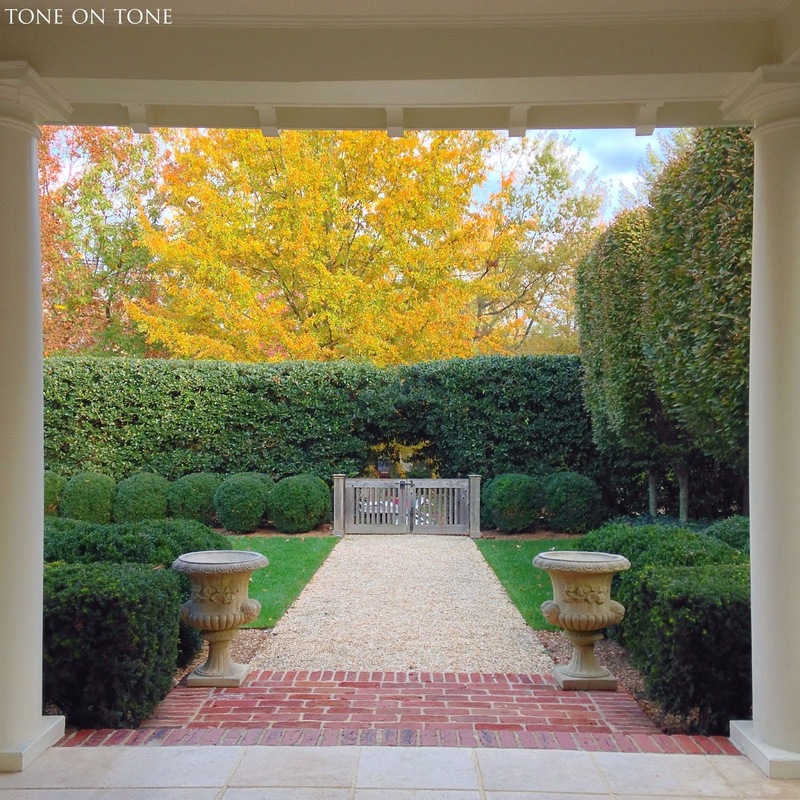 Go ahead and share your fall Instagram vignettes with us. 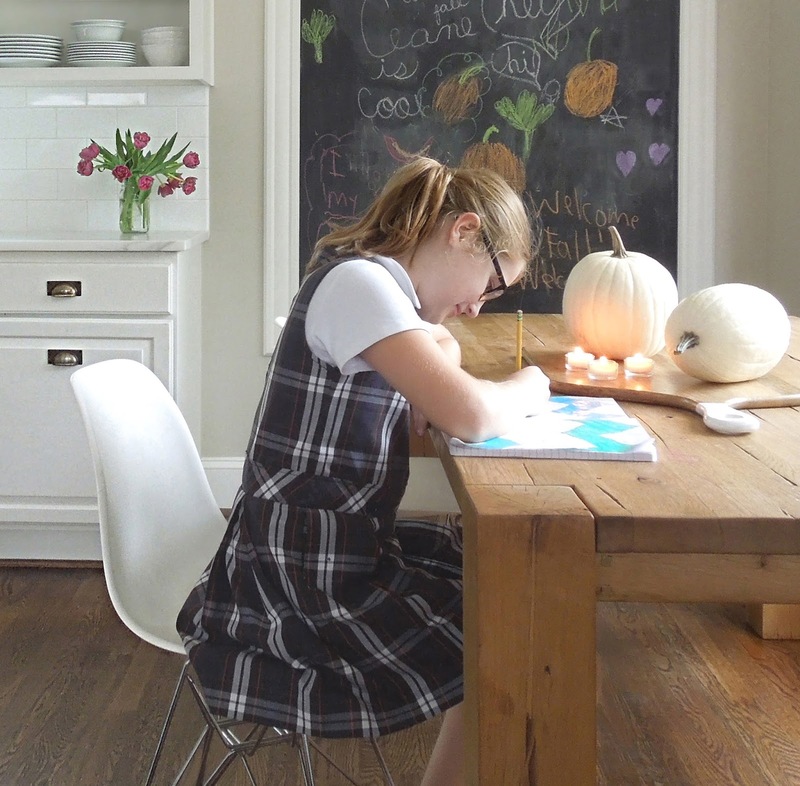 Kelly's 100-year old home is cool and eclectic, just like she! 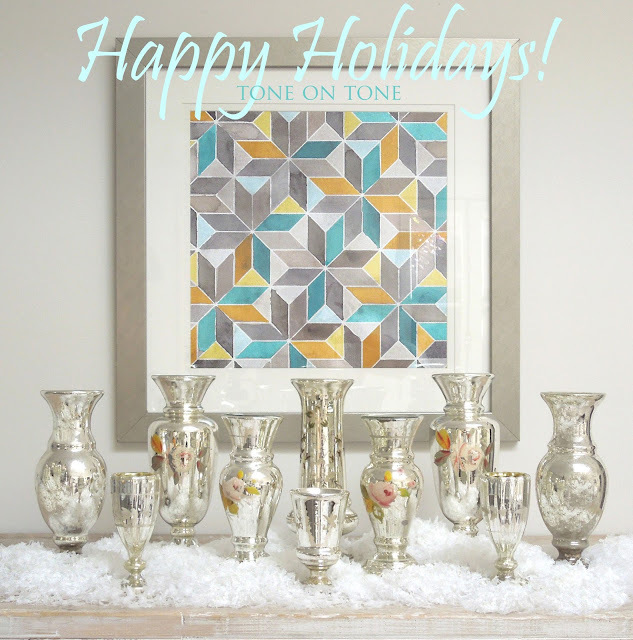 If you want fun, fabulous home projects, pop over to Kelly's blog and, while there, check out her holiday decor such as the above Christmas mantel with festive mercury glass. Kelly and the rest of us want to see your Christmas photos on Instagram. 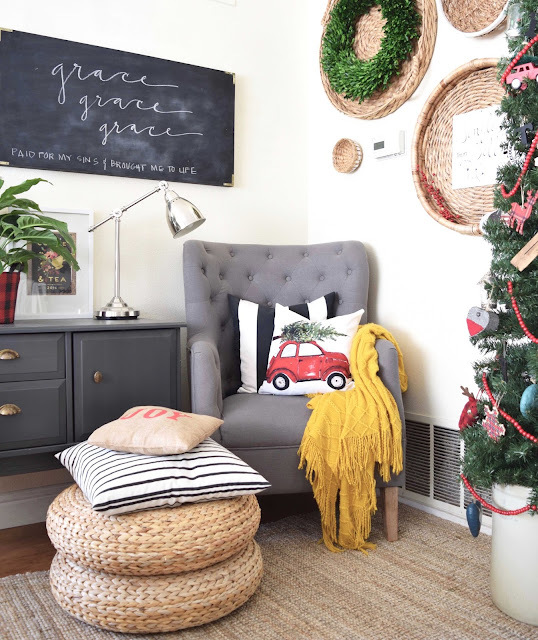 ABOVE: A cheerful Christmas corner in Alma's home, which is bright and beautiful. Check out her IG site. 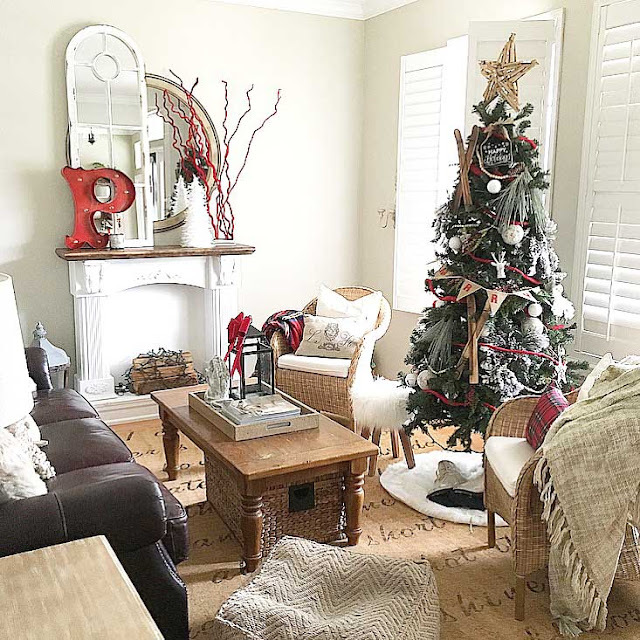 BELOW: Bec's awesome living room styled and layered effortlessly for Christmas. Here's her IG site. Whew! This post is long enough, so more next time. It's foliage season once again in New England. Maine, which is nearly half of New England and predominately forested, is ablaze with fall colors now. Maine's hilly terrain, red blueberry fields and water reflections all heighten nature's brilliant display. 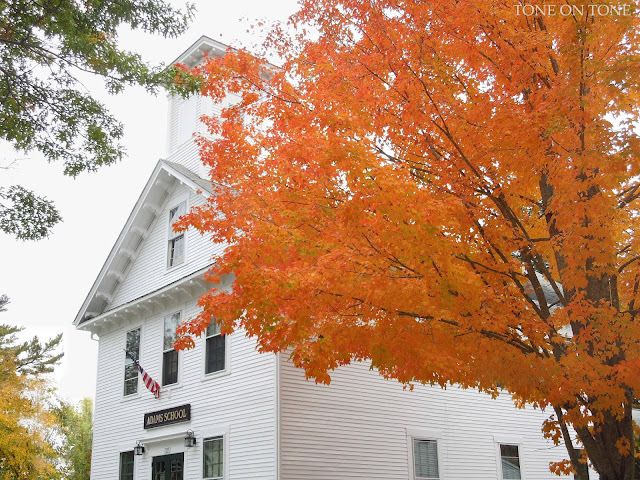 So go see the golden birches, fiery maples and scarlet oaks at their peaks. And might I suggest a visit to our seaside town of Castine? The many historic homes, painted crisp white, are especially stunning against the vibrant hues. Here's a quick look from our stay last week. 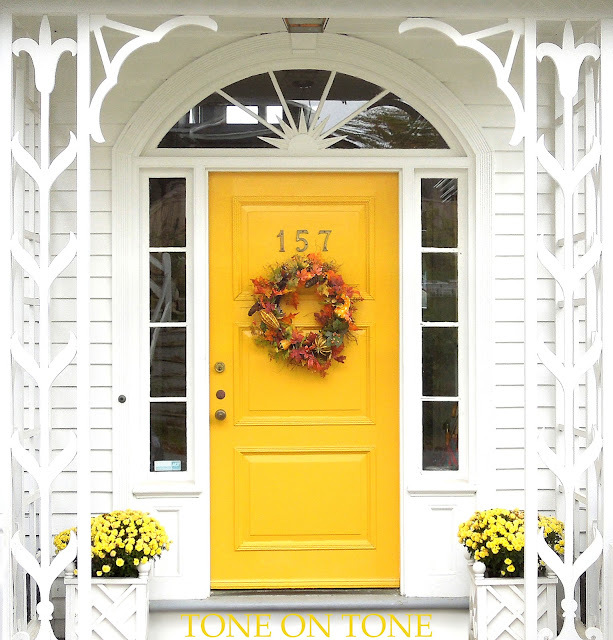 Hello, sunshine :) Happy, bold and gutsy, this sunflower-yellow door framed by whimsical trim livens historic Castine. LOVE IT! 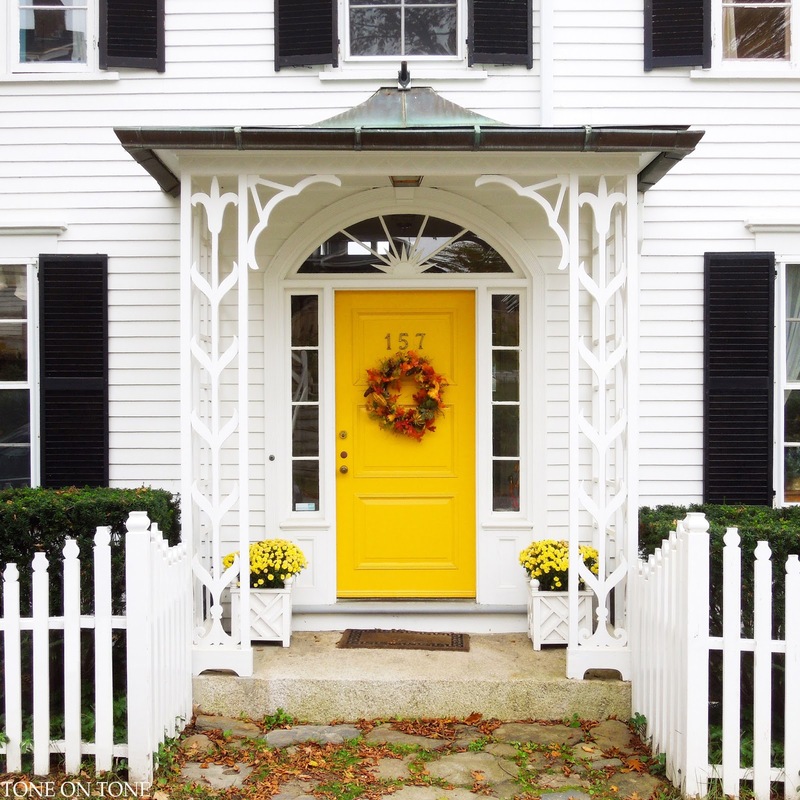 With an autumnal wreath and yellow mums, it looks especially welcoming. 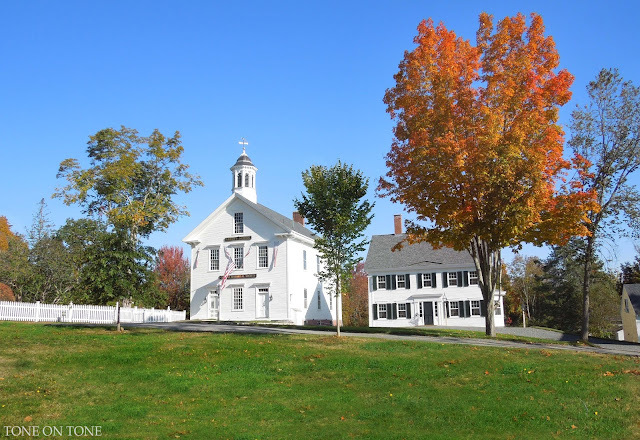 Don't miss the sugar maples on the village green where the Adams School (above) and Castine Historical Society (below) are located. In addition to the foliage, many late summer and fall flowers (dahlias, sunflowers, mums, asters, etc.) were still putting on a show. Our hedge of 18 Limelight Hydrangeas, which we planted last summer, was covered with blooms all tinged with a dusty rose. For a casual supper with friends, I clipped an armful for an arrangement in the antique urn. I also gifted a few bunches to our friends. PS - See more from last fall here. 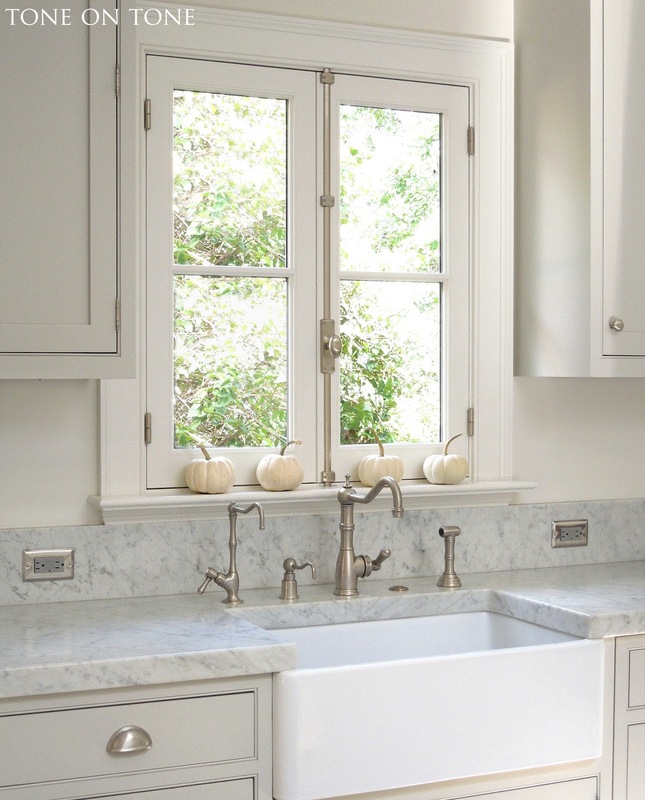 Ceane, my friend and client, and I were chatting about all the changes in her newly updated kitchen (the one I wrote about here), and what else was left for us to tackle. Artwork came up, and I knew we had to inject a pop of something bold, colorful and fun for this family of five. 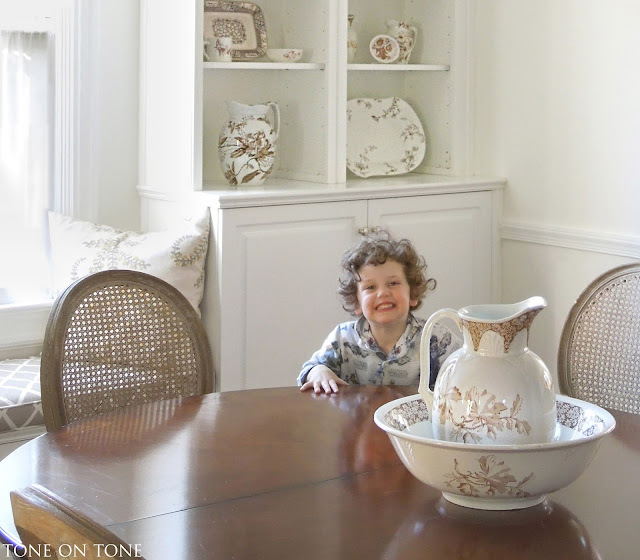 Ceane and her husband have three adorable children plus a mischievous puppy. I immediately thought of an oversized chalkboard. How cute would it be to have the kids create their own art?! Plus it would certainly keep them busy while mom and dad make supper. 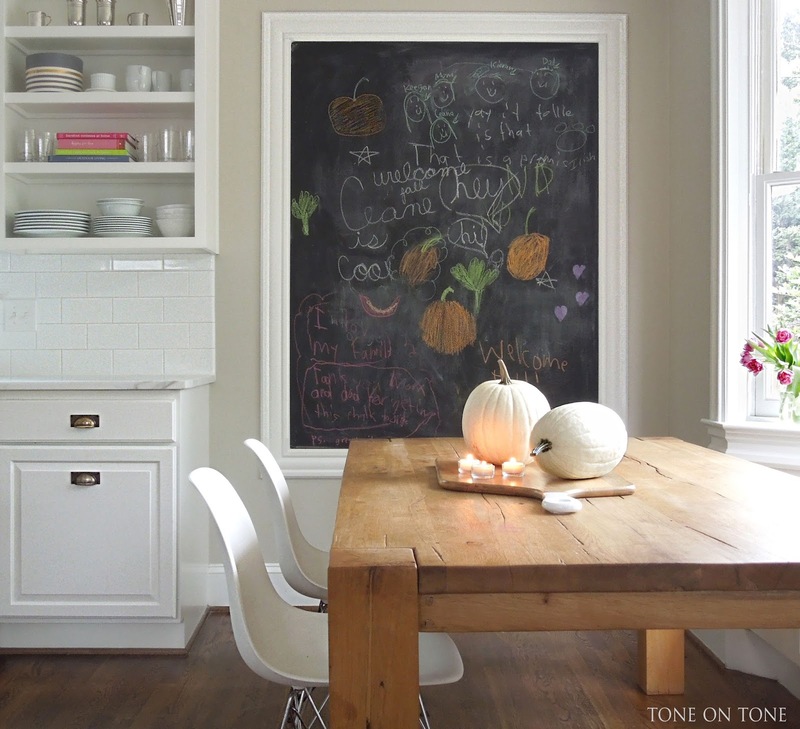 And, the chalkboard would add a cool yet casual vibe to this historic home. Instead of gutting the kitchen, we had the cabinets repainted. New appliances replaced tired and dated ones. New Calacatta Gold marble countertops, 4" x 8" subway tiles, and divided-light windows brought back classic charm to a space that had been previously renovated with a hodgepodge of materials. 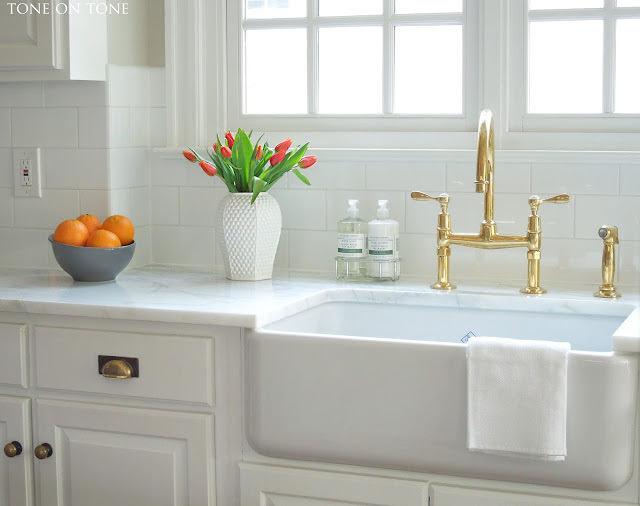 The piece de resistance, which we all agree, is the unlacquered brass faucet over a farmhouse-style sink - both added during the makeover. I suggested the unlacquered brass finish to complement the original brass hardware that we reused. ABOVE: The gleaming faucet set about a month ago. BELOW: Today the 'living' patina is a bit darker, more mellow. It's interesting to see the finish change weekly. 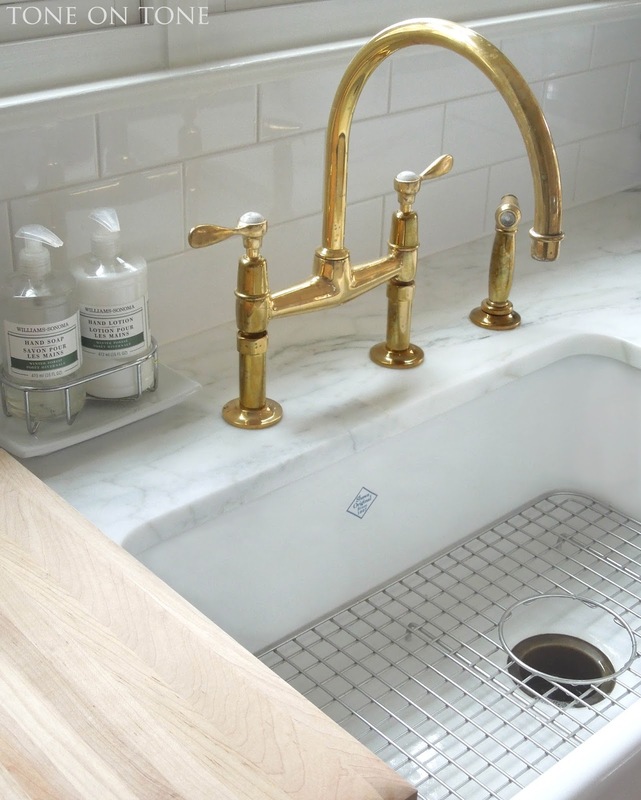 I'm guessing in a year or so, the patina on the faucet set will resemble the old brass knobs and bin pulls. 1) Used blue tape to mock up various sizes. 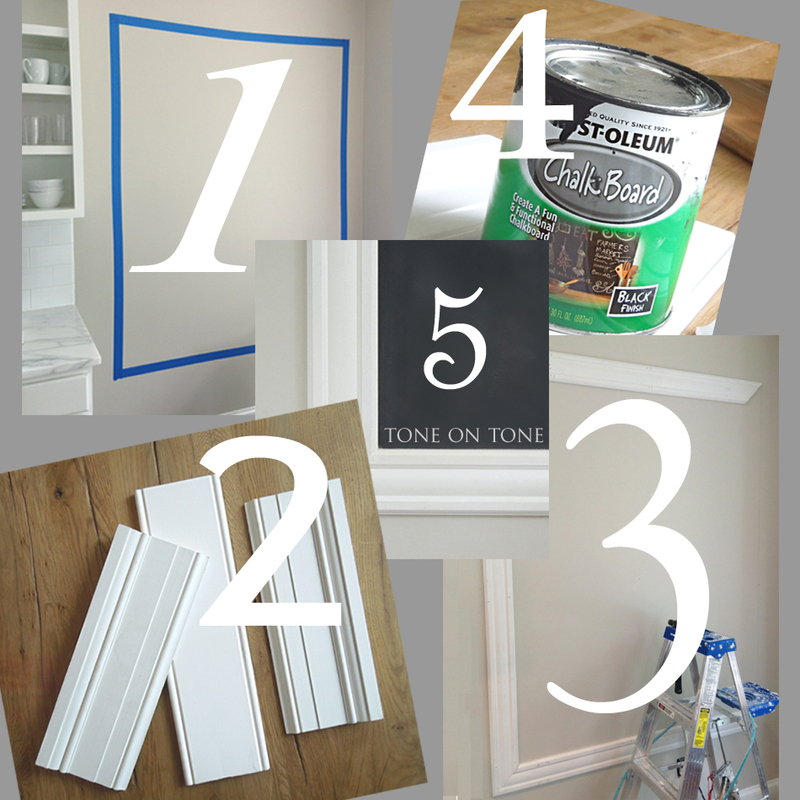 2) Selected already-primed stock moldings (window and door casings) for the frame. 3) Nailed the moldings to the wall. (Most lumberyards will miter cut moldings.) Then painted the frame. 4) After research, Ceane selected Rust-Oleum's Specialty 30 oz. Flat Black Chalkboard Paint. 5) Applied 3 coats of paint, letting each coat dry completely. 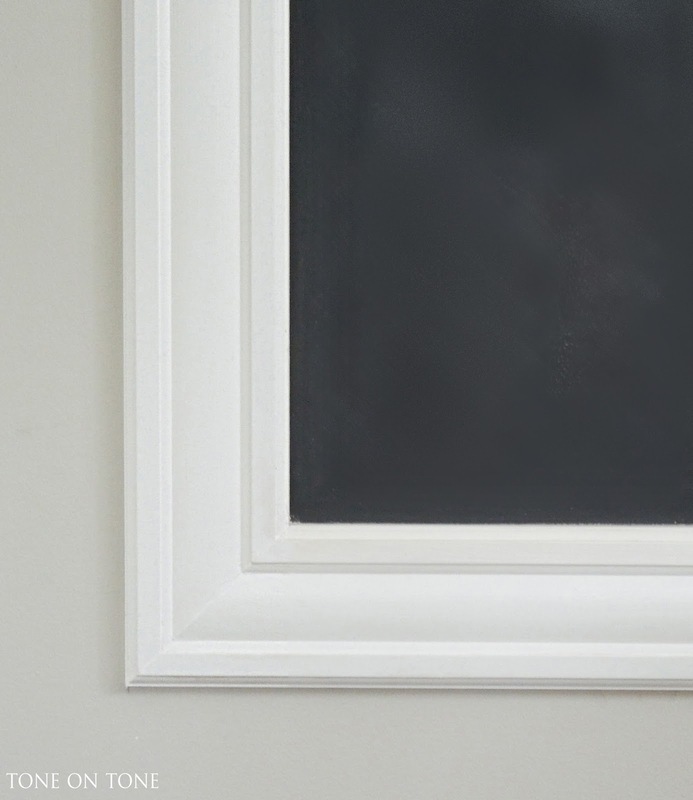 Tip: use blue tape to cover frame to keep paint off. One final step I learned from Ceane: the entire chalkboard must be conditioned / seasoned by rubbing the side of a piece of chalk onto the painted surface; then the residue wiped away with a barely damp sponge or paper towel. Otherwise the first image drawn will be 'etched' in the painted surface, leaving a shadow even after wiping. The kids could hardly wait for the paint to dry - didn't take them long to start having fun! 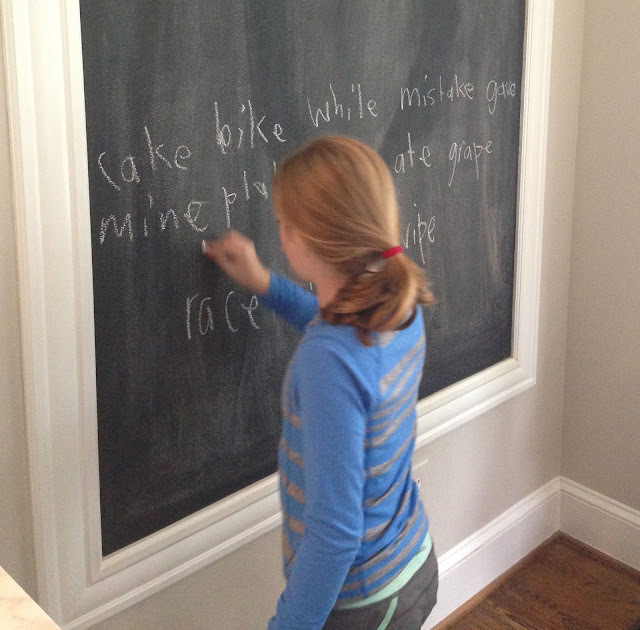 The chalkboard is also great for homework such as practicing for a spelling bee. 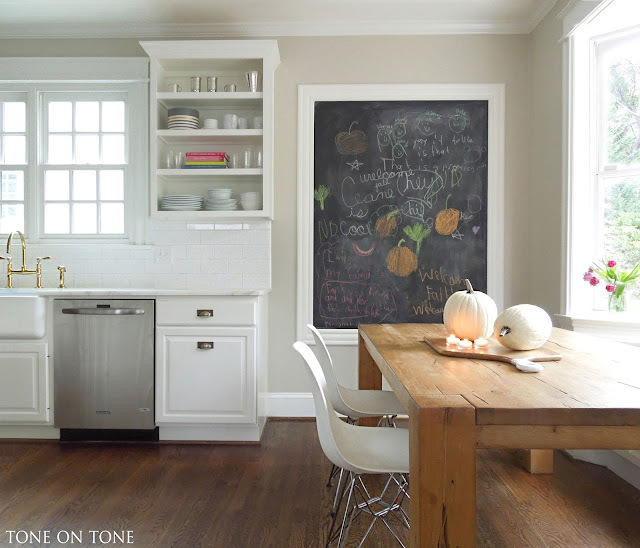 And wouldn't it be cute to write the menu for a casual meal in the kitchen? While there photographing, I also did a little styling. Here's a peek of the living room. 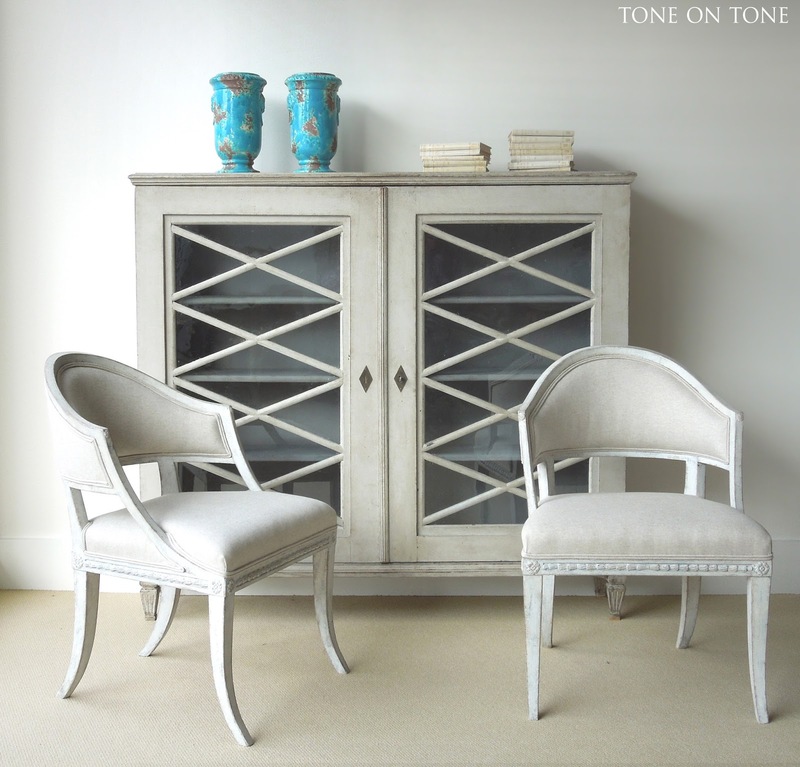 By the way, Tom and I just installed this antique French gilded mirror from Tone on Tone. I gathered a bunch of white pumpkins and a couple of blue-and-white bowls, and voila: simple yet festive for fall! The sofa, clubchair and ottoman are from Crate and Barrel. 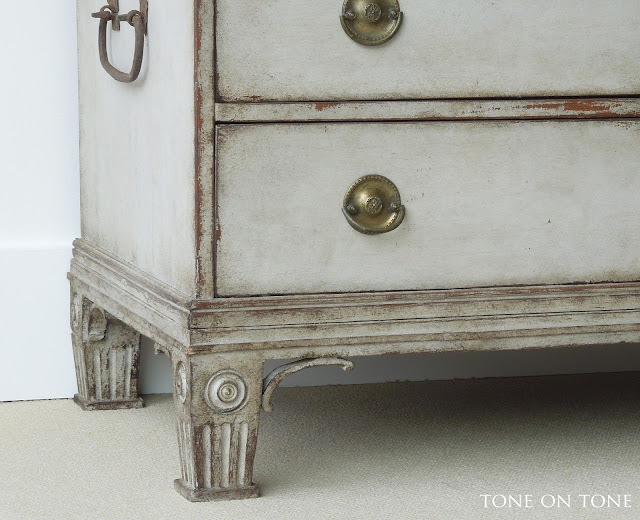 Small footstool from Tone on Tone. Sconces from Aidan Gray. Indigo fabric on pillow is Jasper by Michael Smith. 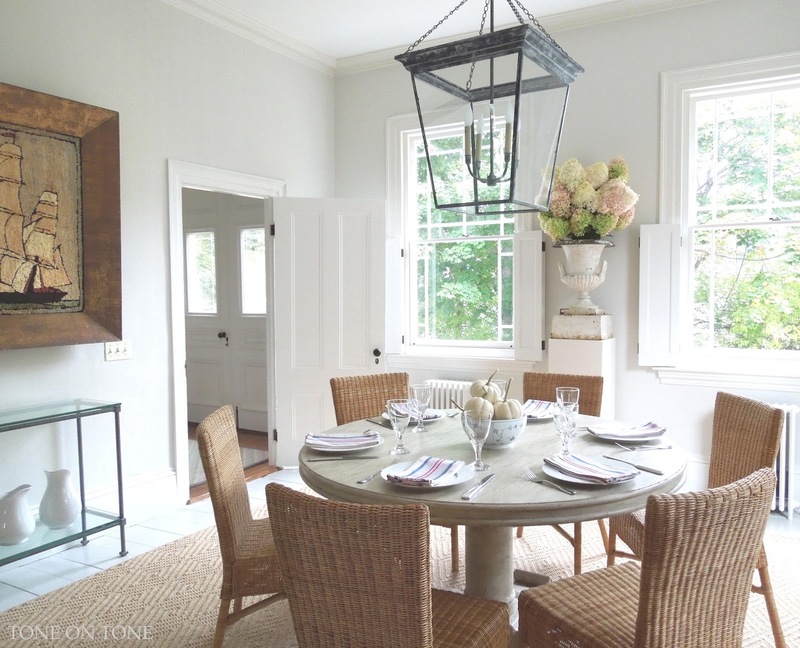 Dining room lantern from Circa Lighting. 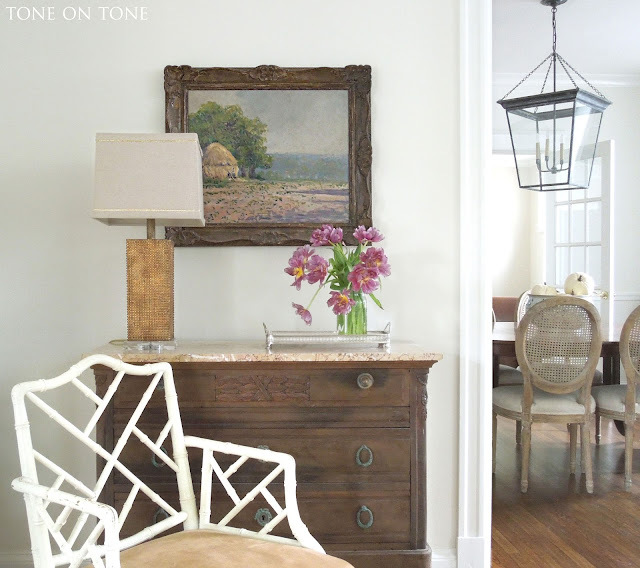 Paint color Swiss Coffee by Benjamin Moore. 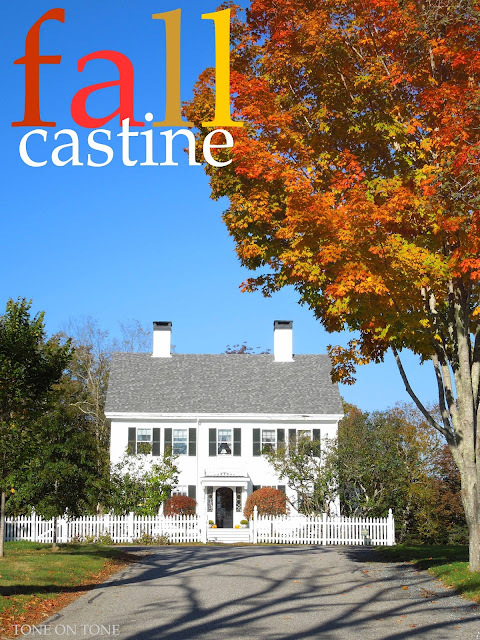 I hope you've enjoyed seeing more of this beautiful home. Ceane, you're the best - thank you! !